MOSCOW, May 8. /TASS/. Russia will upgrade its most advanced Korsar drone to increase its operational range and furnish it with an electronic warfare system, state hi-tech corporation Rostec said on Tuesday. 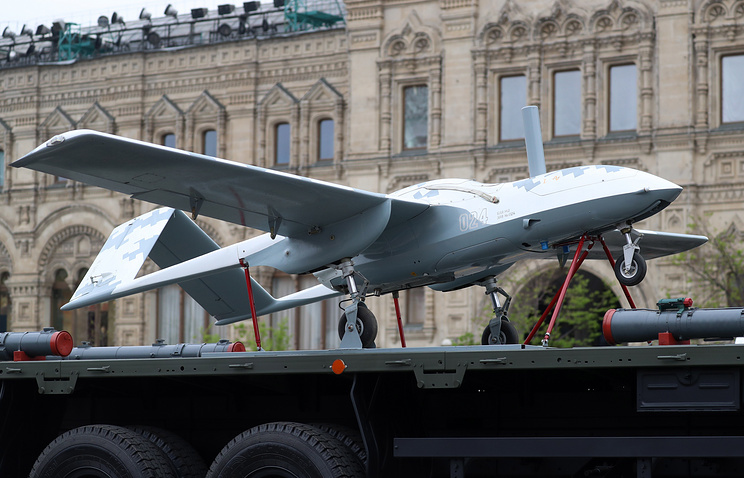 The cutting-edge drone was unveiled during the night rehearsals of the Victory Day parade in Moscow. The Korsar comprises several drones, a control panel and other systems. "In the future, the system may be equipped with drones with improved characteristics and additional functions. In particular, there are plans to increase the operational range to 250 km and also equip the drones with electronic warfare systems and advanced reconnaissance means," the corporation said. Work is currently underway to put Korsar systems into serial production, Rostec said. In its present-day version, the Korsar is designed to reconnoiter the terrain, carry out patrol and observation flights and perform aerial surveys within a range of up to 120 km. The drone is equipped with a piston engine and a pusher propeller and is capable of developing a speed of up to 150 km/h. The Korsar weighs 200 kg, has a wing span of 6.5 m and a fuselage length of 4.2 m.
As Rostec noted, the Korsar can be used for civil purposes, such as environmental monitoring, control of roads and infrastructural facilities, forest fire prevention and operations to search for and rescue people. The Korsar drone has been developed by the Rybinsk-based Luch Design Bureau, part of Ruselectronics Group.